"What's an open question?" you ask? It's the easiest way I found to meet people and find out what's going on. What's there to see in your beautiful city? Where is a good place for breakfast? When does the next tour/bus/train leave? Why are there so many people here for this event? How do I find a taxi/ticket/way to San Jose? Do you know of an inexpensive place to stay for the night? I ask a lot of seemingly dumb questions, and I can get a lot of local, inside information, fast. But I remember that some of the people I might meet might be con artists. The easiest way for me to deal with this is not travel with anything worth losing. I wear a money belt and walk away from anything that sounds funny. Yet, going to someone and asking a question, is safer that having them come up to you and ask questions. (Why is that? Because when you ask, you're in control. When they ask, they are.) Open questions are better because I can find out if the person I ask can be helpful or not. I like to ask open questions in the local language. Spend time with that phrase book. I find it opens a lot of doors and impresses the locals. 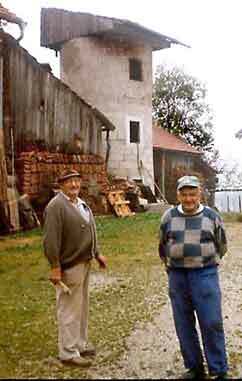 Here I asked in German these two gentlemen on a small farm in the middle of Bavaria, my favorite open question: Do you know of an inexpensive place to stay for the night? They laughed and one of them proceeded to tell me I could stay in his guest room if I helped with some of the farm chores. I agreed and fed the chickens for my supper. It's a Farm Stay, Bavarian style. All I had to do was ask my favorite open question. What a blast! 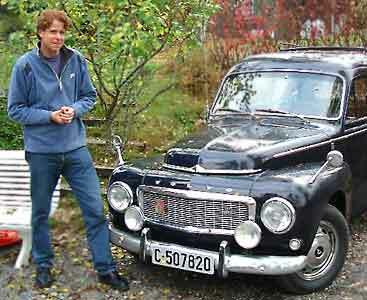 This Norwegian was very proud to show off his Volvo, the first car he ever bought. He was 16 years old. It's now over 20 years old and still running great. He ended up giving me a ride in the countryside outside his Norwegian village. We drove along his favorite back roads, places I would have never seen on my own. I find I learn so much with this simple trick of the open question. I ask, "What's this?" pointing at some strange building or interesting item for sale at a market. Other times I strike gold! Once, I was invited to stay at the local's home after getting a free tour of downtown Gent in the fascinating country of Belgium. Again, all I asked was "Do you know of an inexpensive place to stay for the night?" The man was a businessman with a family. All good signs of a safe place for me to stay. Open questions can do wonders. Here is my Dutch friend Nikki that I met in Turkey. She's in the process of making Christmas presents for her friends and family in the Netherlands. 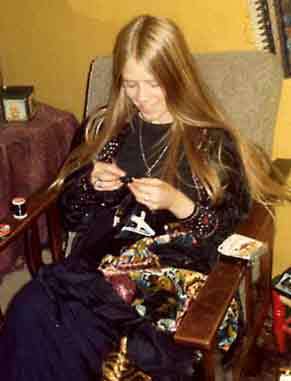 One Christmas, I stayed at a home of a Dutch girl I met on a ferry boat crossing the Bosporus strait the summer before. This was on my way back from Asia to Istanbul, Turkey. We exchanged addresses, and she invited me to stay at her family's apartment in Ede, Holland, if I was in the area. That fall, I was an exchange student in Germany and wrote her. Towards the end of my letter, I asked an open question, "I wonder what I will do for Christmas?" and was invited to spend Christmas with her family. It was fabulous! I remembered to return the favor. I met two girls from Scotland on a boat above the Great Barrier Reef in Australia. We spent the day scuba diving and sunning ourselves on the deck. They were on a round the world trip, going from west to east. A month later they would be in California. I invited them to stay a week with me at my place in Huntington Beach, California. They came. They did Disneyland and Hollywood on their own. I dropped them off in the morning and picked them up after work. They took in the sites in Southern California that way and had a great time. On the weekend, I wanted to take them to someplace special, the Orange County Fair, where we listened and danced to Creole/Zydeco music. Something they never knew existed. I bought them both music CDs as a souvenir. We had a blast! These special adventures don't happen every day. But they do happen. Taking full responsibility for your vacation is a great step to safe and exciting independent travel. I keep my eyes and ears open and keep asking those open questions. As always, I exercise caution when I choose to stay at the homes of strangers. Travel does have its risks as in all life. For more information, go to my Stay Safe Page .